Let’s rewind my life back six years ago. I had a two-year-old daughter with sensory issues whom I didn’t feel was adjusting to daycare. I LOVED teaching high school and my journalism students, but I had to make the difficult choice to leave my life as a teacher behind and put family first. Not to mention, I was always sick and tired and waking up every day to go to work was becoming more of a chore (a few years later I’d be diagnosed with Hashimoto’s Disease). Shortly after I quit teaching, most of my time was dedicated to my child, and, of course, my obsession with photography. While I was actively involved with my local romance writers’ group, I met two really nice owners of a new publishing house. I showed them my photography and PhotoShop designs (mostly of my little girl) and began working for them as a cover artist. That was almost six years ago. Since then, I feel I’ve grown as an artist and as a writer. I also initially published my Whispers series with this publisher. We parted ways when they closed down their YA line, but thanks to the self-publishing boom, I was able to put my books back on the market. Thanks to the self-publishing, I’ve also developed a prolific freelance artist business. It’s the best of both worlds. I get to spend my days writing and designing artwork. And even though I’ve often thought about going back to teaching, my focus now has to be my family, my health and my writing/design career. I don’t know if I will be able to fit a full-time teaching career into the equation, not especially since I’ve made so many strides toward better health. I’m busy working on book four with my new writing partner. Details coming soon, I promise. Let me just say that she’s a formatting genius, a very creative paranormal author, a practicing witch and a TOTALLY cool person. In the meantime, I’d love to share some of my artwork with you. 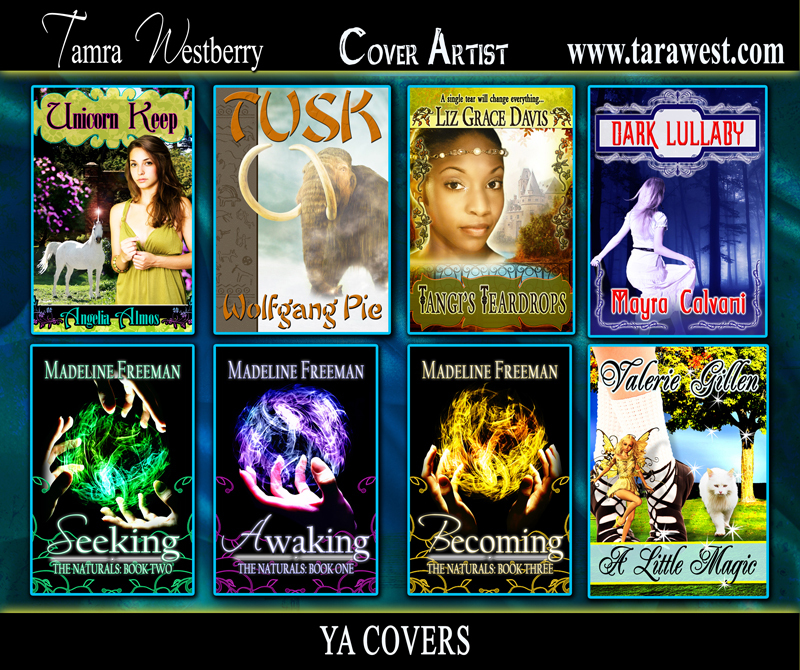 I’ve got many more covers on my site: http://www.tarawest.com but here’s a few I’ve designed for Indie authors. And believe me, I don’t want to slight any authors. Picking favorites was hard, so I’ve limited today’s covers to just those authors who write YA. After all, we YA writers gotta stick together. Categories: Uncategorized | Tags: angelia almos, cover art, cover artist, graphic designs, liz grace davis, madeline freeman, mayra calvari, tamra westberry, valeria gillen, wolfgang pie | Permalink. Squeee! 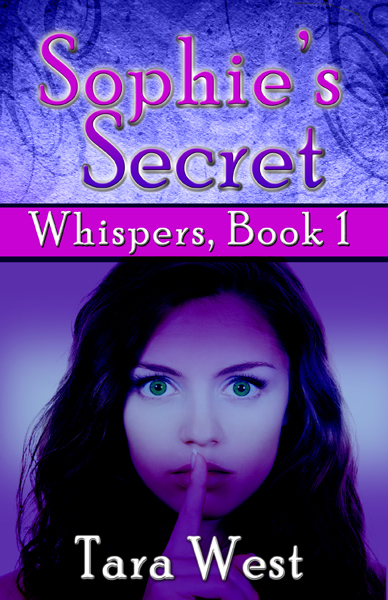 Sophie’s Secret has received some awesome reviews at Smashwords and Barnes and Noble. It’s currently free there and I’m trying to get Amazon to honor the free price at their store as well. So far, no luck, but I’ll keep you posted. Print versions of the Whispers series are also available at amazon.com but those were published about four years ago by my former publisher. I’ve recently updated the series. Some of my readers have asked if I plan on publishing book 4 in the Whispers series, and the answer is YES! I’m already planning the girls’ sophomore year, and I promise you won’t be disappointed. For those of you who don’t know the full story, my Whispers series once had a home with a publishing company. After they discontinued their YA line, Whispers no longer had a home and other publishers didn’t want to finish out the series. So I quit writing them. I never envisioned that I’d soon be able to self-publish these books thanks to the ereading revolution. I’ve been seriously writing for about ten years and now is a good time to be an indie writer. Before, it was considered taboo to publish a book without the backing of a publishing house, but thanks to pioneers like John Locke, Amanda Hocking and J. A. Konrath, many indie writers are finding success without publishers. I sure hope I turn out to be one of those authors. So far, my reader reviewers are giving me quite a bit of hope. Categories: Uncategorized | Tags: barnes and noble, kindle, nook, paranormal romance, reader reviews, sophie's secret, tara west, ya paranormal | Permalink.